NOTE: This page is about Toraboyo Beach in Second Life. 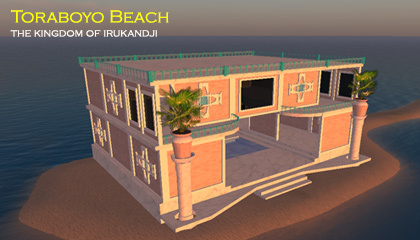 The InWorldz version is here: Toraboyo Beach in InWorldz. Toraboyo Beach is a scenic region Aboyo State in far-eastern Irukandji. In Second Life, Toraboyo Beach was actually a rebuild of the earlier sim, Tora Tora Passage, for the sake of making it more marketable. The sim was also re-terraformed. Gone were the broad acreages with a river running through, and in their place a wide shallow sea. A promontory of land filled the northeast corner of Toraboyo Beach which it shared with Cabria Island and Grand Aboyo Island. The massive 31-kilometre long Trans Irukandji Causeway passed through Toraboyo Beach from Old Fort Island and Minoan Atolls, finally passing into Grand Aboyo Island in the west. Neighbouring regions to Toraboyo Beach, clockwise from northwest, were Minoan Atolls, Cabria Island, Grand Aboyo Island, Old Fort Island, Tasman Sea, and Mount Aboyo Island. Land was never offered for sale after the name change, as Toraboyo Beach was more intended as a pleasure sim. Only one major structure existed on the sim, which is the bathhouse shown in the adjacent photograph. 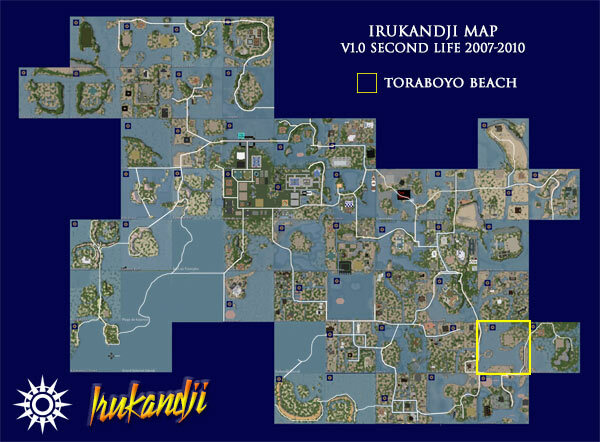 Some years later when I built Irukandji v2 on the InWorldz grid, the name Toraboyo Beach emerged again, however that version was a significant residential region. Apart from both versions being part of Aboyo State, and on the edge of the kingdom, no other similarities exist.